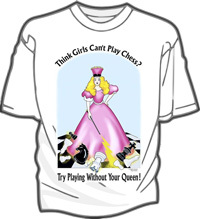 Great tee for the chess gals . . . it tells it like it is! Try playing your chess game without that beautiful lady . . . her Majesty, the QUEEN . . . and then you'll know why we made a T-shirt in her honor! 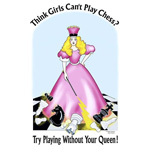 Reads: "Think Girls Can't Play Chess? Try Playing Without Your Queen!"